In the Spring of 2011 VisionArc partnered with the World Economic Forum’s Global Agenda Council on Design to brainstorm and develop energy monitoring concepts in the aftermath of the March 2011 earthquake and tsunami in Japan. Japan is the only developed country in the world where household energy consumption exceeds industrial and business use. In the days following the earthquake and tsunami and the accidents at the Fukushima nuclear power plant, it became clear that issues of energy security and availability loomed large and the risk of future blackouts due to summer home cooling and other power demands in Tokyo were imminent. 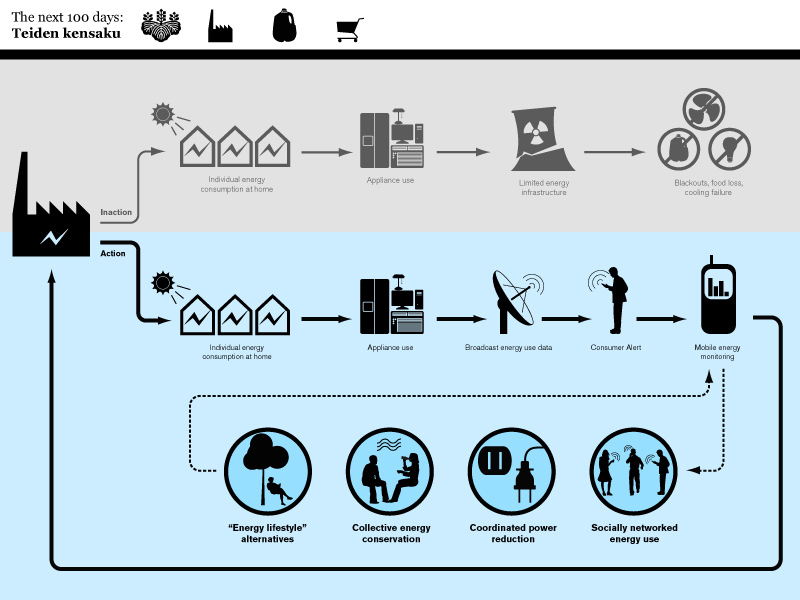 VisionArc and the Global Agenda Council on Design studied a concept we called “Teiden Kensaku”, or “Blackout Alert”, for using a social networking platform to create a feedback system that could connect daily energy consumption to its larger consequences at the regional and national scale. 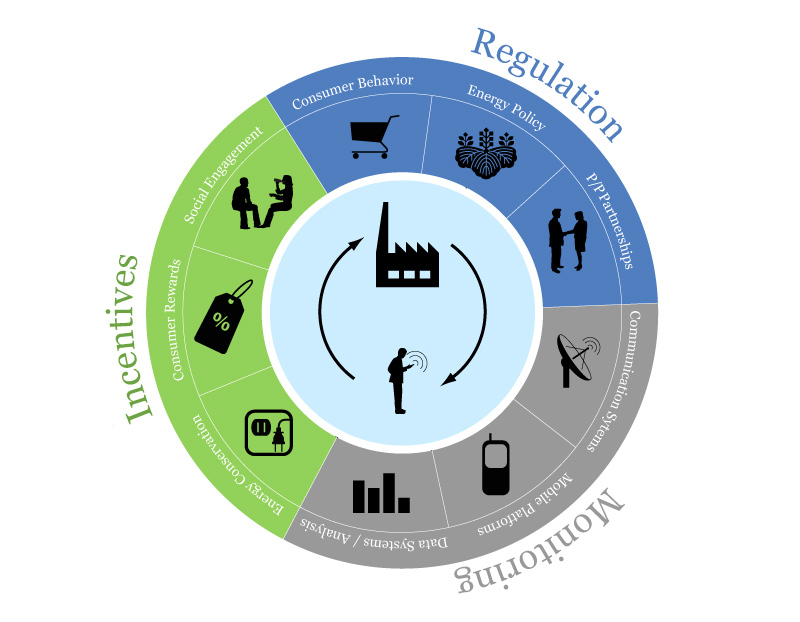 The idea promoted behavioral change through consumption habits and encouraged individual actions of conservation through information and incentives. Instead of a centralized top-down policy of enforcement or surveillance measures, the system proposed a voluntary bottom-up framework. The platform would demonstrate that small individual gestures of conservation can account for a major impact on overall resource usage. The platform proposed short and long term functions. For short-term concerns, an alert function would send mobile device notifications thirty minutes prior to a blackout, encouraging people to turn off their individual air conditioners and instead spend time in public places with air cooling systems. While this direct reactionary behavior would be important, we proposed putting the system in place for one hundred days prior, to begin encouraging and training new habits for the citizens of Tokyo. The implementation would also include various incentives for citizens to reduce energy consumption and use fewer appliances at home. This mobile device program, conceived as a design tool, would also allow software and utility companies to directly engage their consumers through data analysis, behavioral science, and marketing expertise. At the same time, consumers are empowered to make smarter and more sustainable choices to conserve resources and save on household expenses, while contributing to the greater good.